China plans to counter the Indian US navy mutual agreement's by deploying aircraft carrier in Chinese leased Pakistani naval base in Gwadar, The US Navy and Indian navy comes closer together to confront the Chinese illegal actions in South China and across the Indian ocean. China earlier leased the atoll island from Maldives, which could be converted into a militarily base. 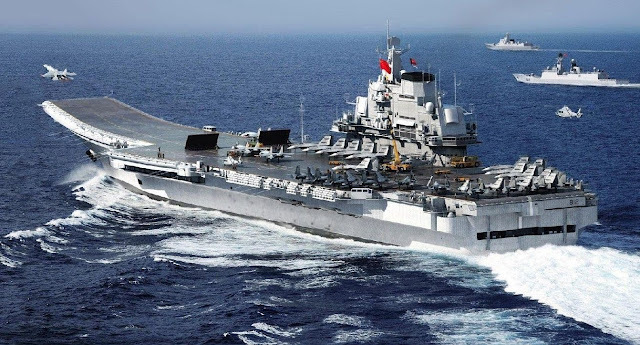 After Indian navy's close relationship with US, China planned to deploy it's carrier strike group in Pakistan, to counterbalance Indian superiority in Indian Ocean region. It allows China to get a over watch over Indian naval establishment in Arabic sea. China get slammed by all sides, South Korea from east, Taiwan and may other south pacific nations in the beneath, and now from Indian Navy too, However China posing as a superior fire power nation by conducting rouge patrols close to international free zone and abducting international waters. The Chinese Indian naval nexus starts, when Chinese nuclear submarines comes to sri lanka and conducted rough patrols close to Andaman. after few days later the Chinese routinely conduct patrols close to Andaman and violating the territorial waters. India is not fully equipped to confront the Chinese, however managed to increase the relationship with US, the major rival of China. Moreover, encircling the India, China proposes maritime silk route, connecting Pakistani Gwadar port and Bangladeshi Chittagong port. China plans to establish a economical sea line around India which is closely escorted by Chinese Naval ships, this allow china can deploy his naval asserts in all sides of India, in Bay of Bengal, Indian Ocean and Arabic ocean. India strongly opposes the plans, however China didn't hear the Indian sounds. they continue work on the proposed plan, and more they leased a island from Maldives in Indian Ocean, This allows China gets a strong maritime superiority compared to Indian Navy, since China has more numbers of naval ships. Later India moved with the US and Japan very closely, even signed many agreements to conduct patrols in international waters. this irked the Chinese too much, China did warned Indian moves with USA so did the Indian communists too, this time India didn't hear Chinese plea and moved with US for more patrols. Meantime China is right on his proposed maritime silk road plan. Earlier India and the US signed a treaty to mutually replenish naval warships in ocean's. This allows allows the U.S. Navy to refuel the Indian navy, or vice versa, at sea with F76 naval distillate fuel and/or JP5 jet fuel. More probably Indian navy gets numerous number of Replenishment oilier in very quick time. Replenishment oilier's are must for conducting long range patrols, India have only four of them, rival china has more than fifteen such ships who assists Chinese long range patrols.